Bandwidth is the difference between the upper and lower frequencies in a continuous band of frequencies. A key characteristic of bandwidth is that any band of a given width can carry the same amount of information, regardless of where that band is located in the frequency spectrum. So I understood bandwidth to be a measure of how much space it takes up in the frequency domain. Am I right in saying that because of symmetry about the Y axis, the same information is repeated for negative frequency values, this is why the "bandwidth" of the bandlimited signal given below is not $2B = B - (-B)$ but $B$. 1) Since the left is a mirror image of the right part only for real signals, if the signal was not real, can we still say bandwidth is $B$? 2) Why do we have two different definitions for passband and baseband bandwidth? Is there any other reason? 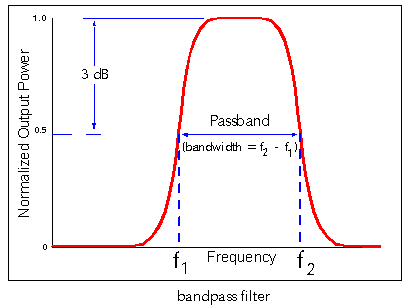 Passband bandwidth is the difference between the upper and lower cutoff frequencies of, for example, a band-pass filter, a communication channel, or a signal spectrum. Baseband bandwidth applies to a low-pass filter or baseband signal; the bandwidth is equal to its upper cutoff frequency. 3) Am I right in understanding that in case of either type of signals, alias-free signal sampling is possible at $2B$ samples per second? You can unify the definitions for baseband and passband bandwidths by saying that bandwidth is only measured at positive frequencies. So for low pass signals, the lower frequency is zero and the upper frequency is the cut-off frequency. For bandpass signals, you have the difference between upper and lower cut-off frequencies (at positive frequencies). 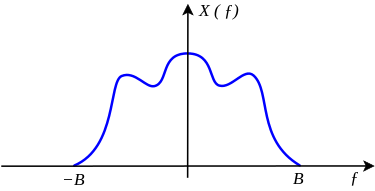 For complex signals, a reasonable definition of bandwidth should take into account that the negative frequencies are not redundant anymore. So a complex low pass signal extending from $f=-B$ to $f=B$ should have bandwidth $2B$. Concerning the choice of sampling frequency for bandpass signals, take a look at this answer. It is not true that a sampling frequency equal to twice the bandwidth is always sufficient. Yet you can usually do better than just sampling with twice the upper cut-off frequency. Not the answer you're looking for? Browse other questions tagged sampling bandpass bandwidth nyquist or ask your own question. Is there a condition for bandpass sampling? Does frequency shifting double needed bandwidth? What is the definition of the bandwidth of a signal?